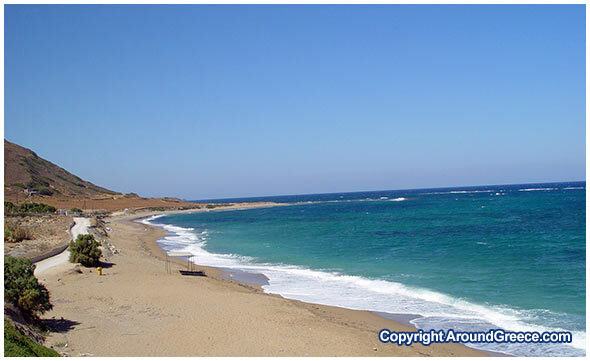 The area of Gyrismata ( Girismata ) in Skyros is one that is very popular during the summer season. Visitors from all over the island head to here to enjoy the beautiful sandy beach and the blue and green waters of the Aegean sea. Located on the north east coast, just a short distance from the main town of Chora, Gyrismata is easily accessible, and visitors will be rewarded by the charming scenery and landscapes that surround the area. Though small in comparison to some of the other resorts and towns spread out around Skyros, Gyrismata has a certain charm and magic about it. This makes it a very attractive place to visit for those who are seeking somewhere to enjoy a very relaxed and peaceful holiday in Skyros. There is a small selection of various accommodation available for visitors to this part of the island, including studios and apartments to let. You will also find a choice of traditional tavernas where you can enjoy a freshly prepared meal.